Nicholas Simon understands that, while his clients’ need a strong advocate, they also need someone who understands them and who will take the time to educate them on the litigation process. Too often clients are left in the dark about what is going on with their cases. Mr. Simon thinks this is wrong and makes himself available at all times to answer questions. To demonstrate his true “open door policy” to his clients, he puts his personal cell number on his business card. With pride, he points out that he gets very few calls. Nicholas Simon, a veteran of Desert Storm (340th Chemical Decon/18th Airborne), attended the University of Houston where he obtained a Bachelor of Science Degree. While attending UH, he received numerous honors, including being nominated by the Provost of the University as the top student in his field at studies. Mr. Simon started his professional career in education as a teacher with Pasadena I.S.D. (greater Houston area). Upon deciding to go to law school. Mr. Simon scored one of the highest LSAT scores recorded by a graduate of the University of Houston and was recruited by Yale, the University of Southern California and UCLA. Mr. Simon decided to stay at The University of Houston, his alma mater, where he received a Dean’s Scholarship. Upon graduation. 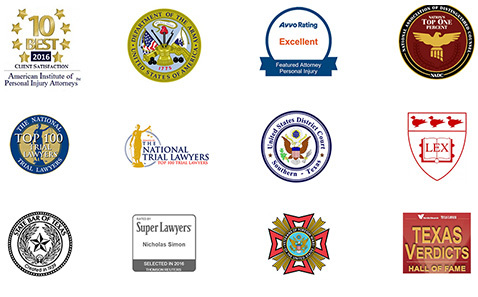 Mr. Simon was hired by one of the most prestigious law firms in the United States, a firm that is currently recognized as one of the top 50 law firms in the United States by The National Law Journal. While at this firm, he worked on cases that resolved or settled for over a Billion dollars. After twelve years of practice with this firm, Mr. Simon decided to give up his 73rd floor office in downtown Houston and open an office on the Gulf Freeway in the Southeast (South Belt/ Clear Lake area) region of Houston, Texas where he could have a more personal relationship with his clients. We know how difficult and confusing it is after you or a family member have been seriously injured in an accident. When others are at fault, we are there to help. These feelings are worse if serious injuries or damages have occurred. Our firm has helped countless individuals deal with this difficult time and to receive the compensation they deserve. Contact us, your personal injury lawyers, at 281-667-4081 for a free consultation!